Happy 16 months to this beautiful girl!! 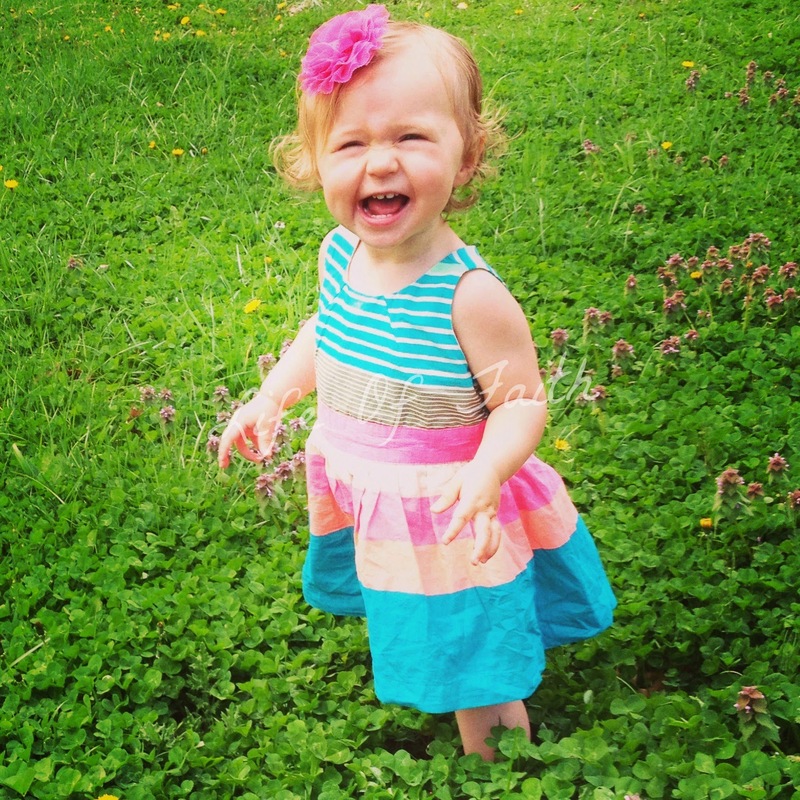 Now that spring has arrived, you are officially in toddler heaven. You could spend all day, every day outside and would love it! You are so happy it's spring, you kept smelling the grass the first few times we went out to play! You're even pretty good at saying the word which sounds more like "ahhtsye". But as you can see from the compilations of pictures for this month, we have been more than happy to let you play outside to your heart's content! You are learning new words every day, and even starting to say some two-syllable words which is absolutely adorable. Your favorite word of all time is "no". I think you say it at least 50 times a day...maybe more. That's fun for mama! You can zip up your own jacket and put your Croc shoes on by yourself now. We are working on getting them on the right foot though:). You are also having a lot of fun "pretend playing" these days. You love pretending to eat fake food and even pretend feeding your baby doll. You are a great doll mama! You are a pretty picky eater when it comes to veggies but you will eat just about any fruit. Your favorites veggies are broccoli and green beans. Your favorite fruits are cantaloupe and grapes. Your absolute all time favorite food is crackers. You will do anything for a cracker! You tried corn on the cob for the first time this month and you didn't quite understand that you could bring the cob up to your mouth. It was entertaining to watch you bring your mouth down to the corn every time. Just look at that concentration, and those crazy eyes haha! You are still sleeping through the night most nights, which is great! Lately you have been waking up at like 3AM saying you want to eat. What's up with that? You've also been saying you want to eat every time we put you down for a nap or to bed. I think you're being sneaky but I always give you a snack or something to make sure I'm not putting you to bed hungry. You still take a morning and afternoon nap. If you miss either of them, it's catastrophic! 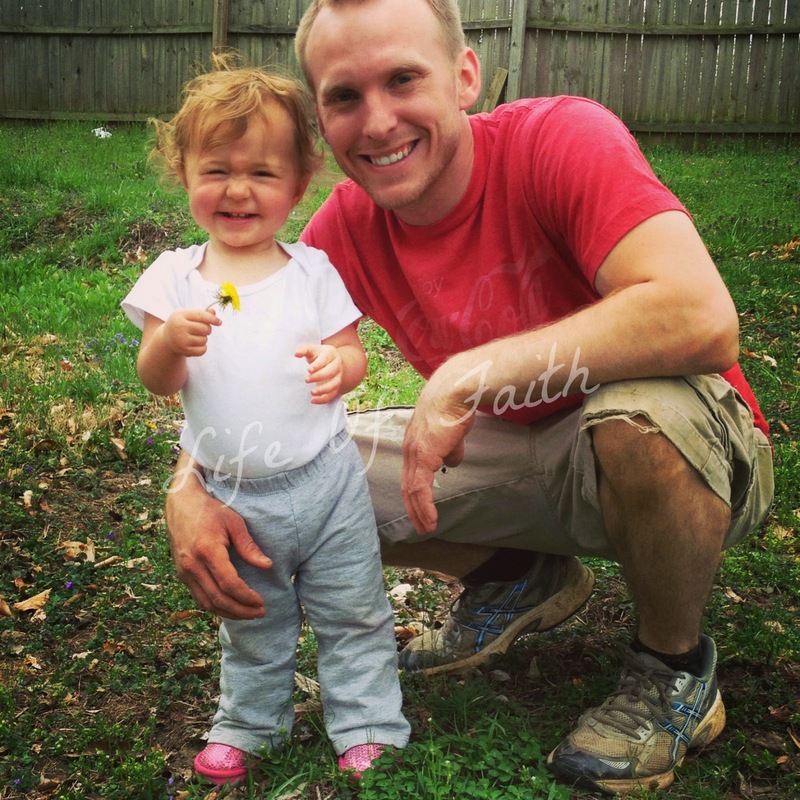 We put a pause on potty training for this month. We've been running around so much, it just wasn't working. We will start back up when you express interest. Although I'm exited about the prospect of no diapers, I'm not in a hurry! 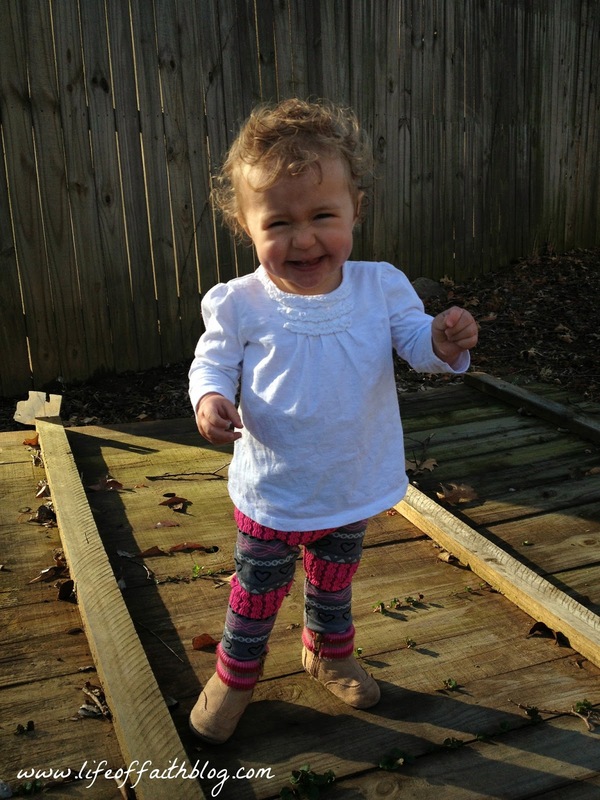 We are making lots of outside memories these days! 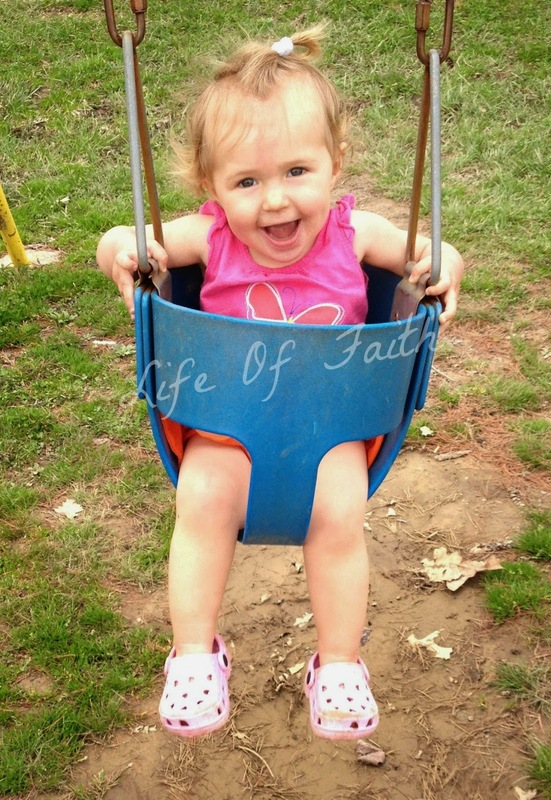 You love playing at the park with mom and dad, but you only like to swing if someone is swinging with you or next to you! 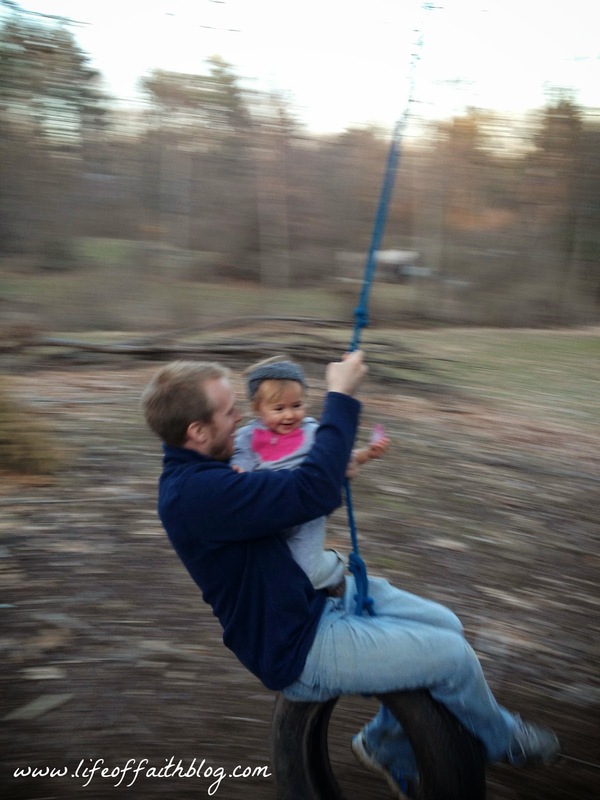 You rode your first tire swing with dad...while mom stood by nervously. Apparently I wasn't too nervous to get a picture though, and I'm glad I did! We have also taken a couple of fishing trips with you. 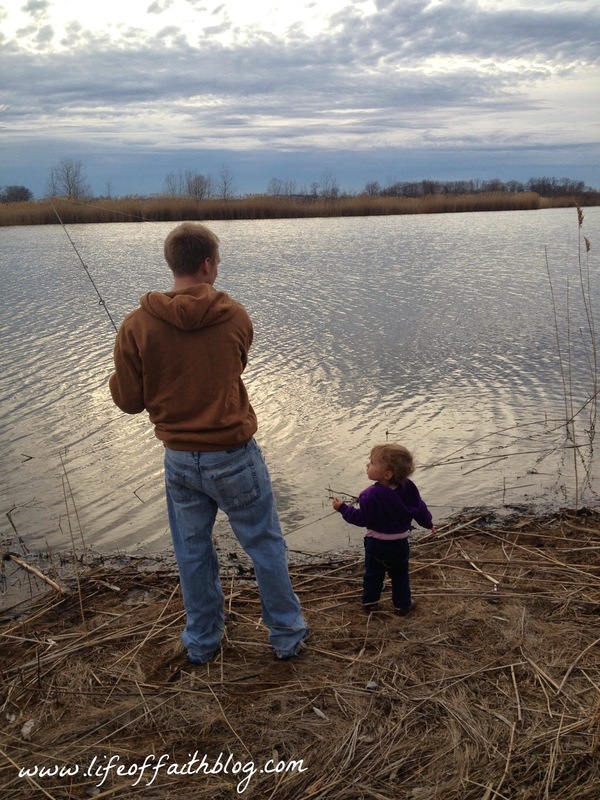 You are definitely a daddy's girl when it comes to fishing! The other night, he asked you if you wanted to go fishing with him and you chanted "fish, fish, fish". When it got too late to take you, he was going to sneak out and go alone but you ran after him calling "fish, fish, fish"! 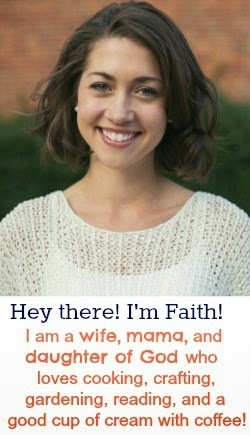 He had to take you then :) You have learned how to reel in the pole all by yourself. I'm just waiting for you to catch a fish soon! 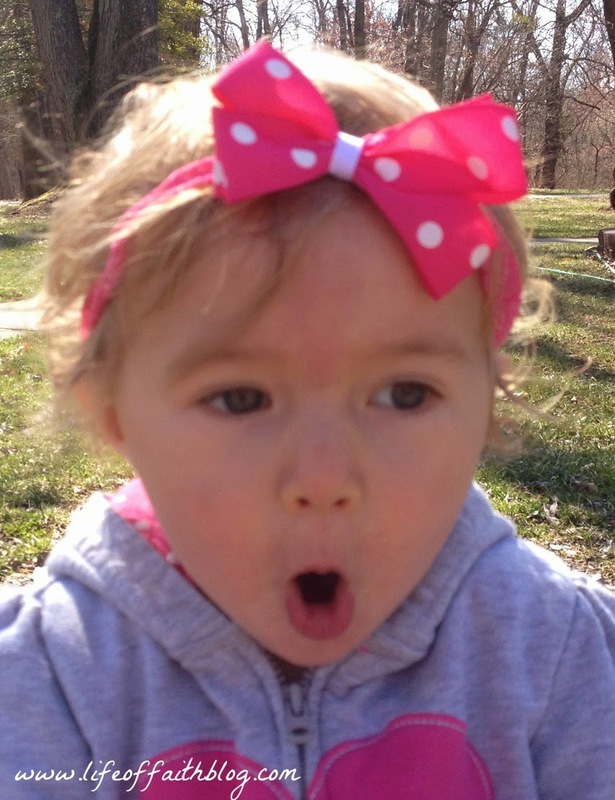 Here's you and your silly face at another one of our fishing trips. 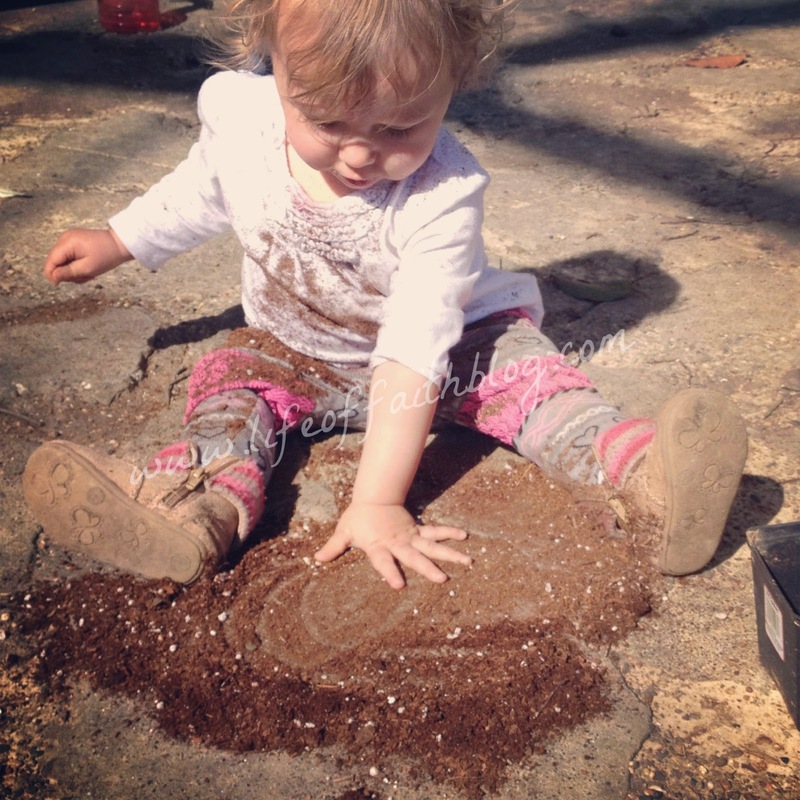 Call me crazy, but I have had a great time teaching you all about dirt, bugs, plants, and all that great stuff. 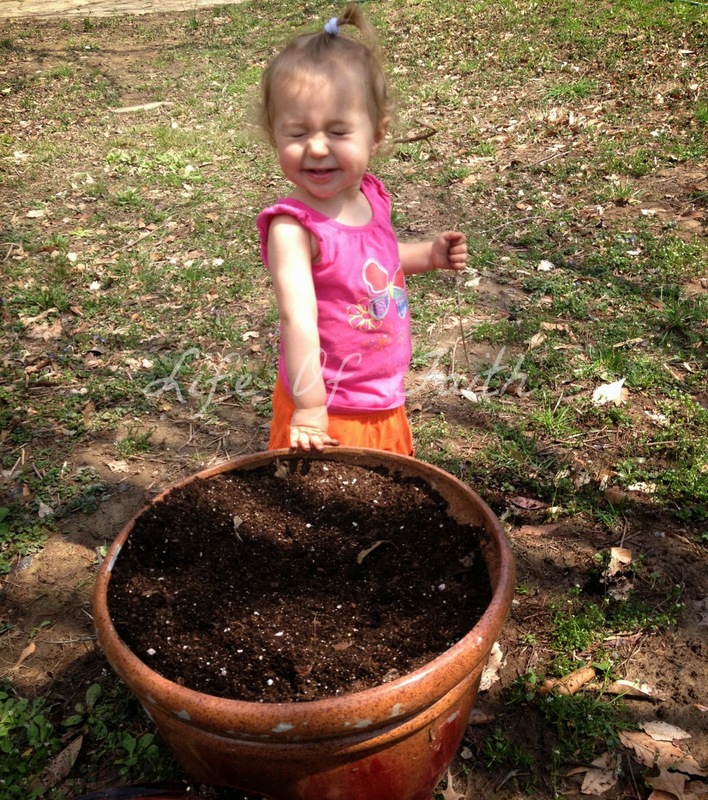 Yes, gardening with a toddler has it's challenges, but watching your excitement to be "playing" outside with me. You even help me water the flowers. 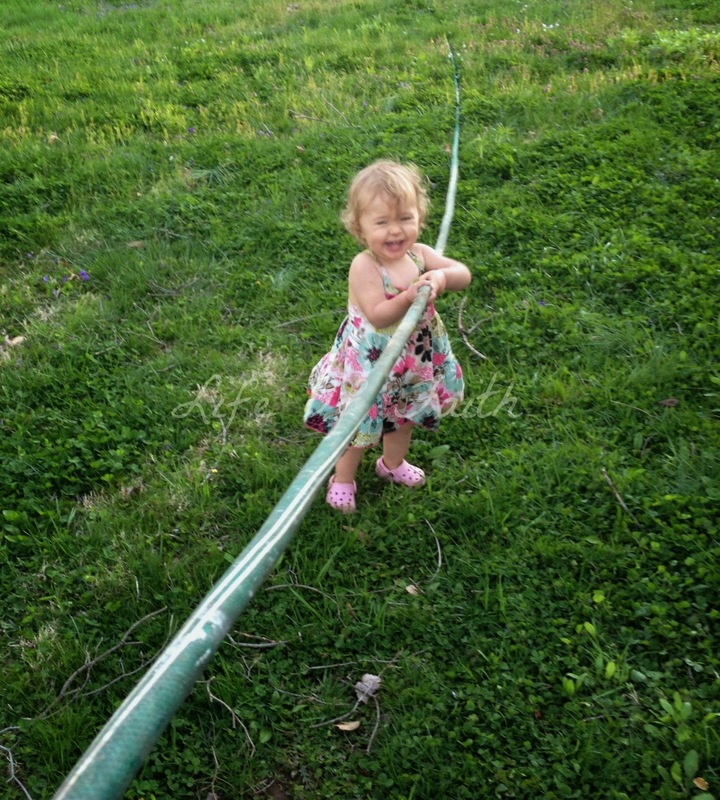 Where else can you find such an adorable little hose helper? It's the moments like this one that make it worth it. You are precious. 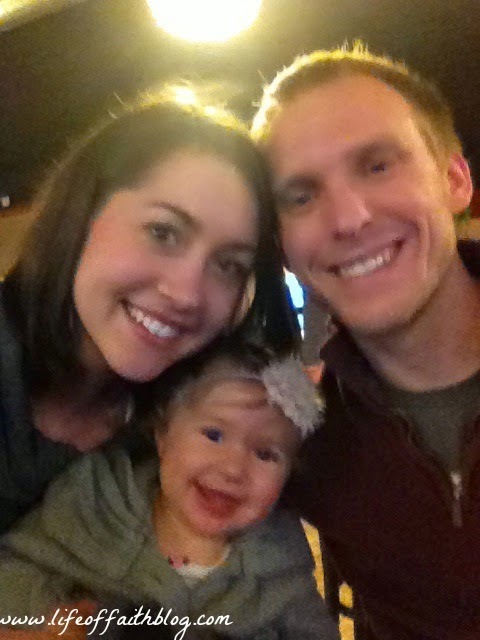 We have had some great family date nights with you along. You even offered to pick up the tab...how sweet you are! 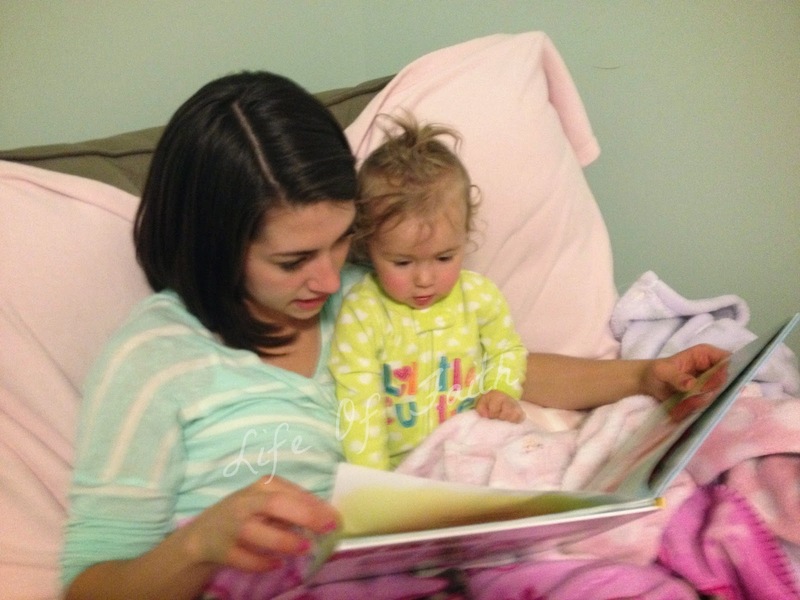 One of our favorite things to do together (besides play outside) is read books. I have made an effort to read you at least one book a day and your love for books makes that pretty easy! I love watching your face while we read...it has wonder and excitement written all over it! Nicole, Matt, Declan and Jake came to stay with us for a couple of weeks this month. You have gotten to see Nicole so often the past few weeks that she has officially become one of your favorites. I'm pretty happy about that, and so are you! 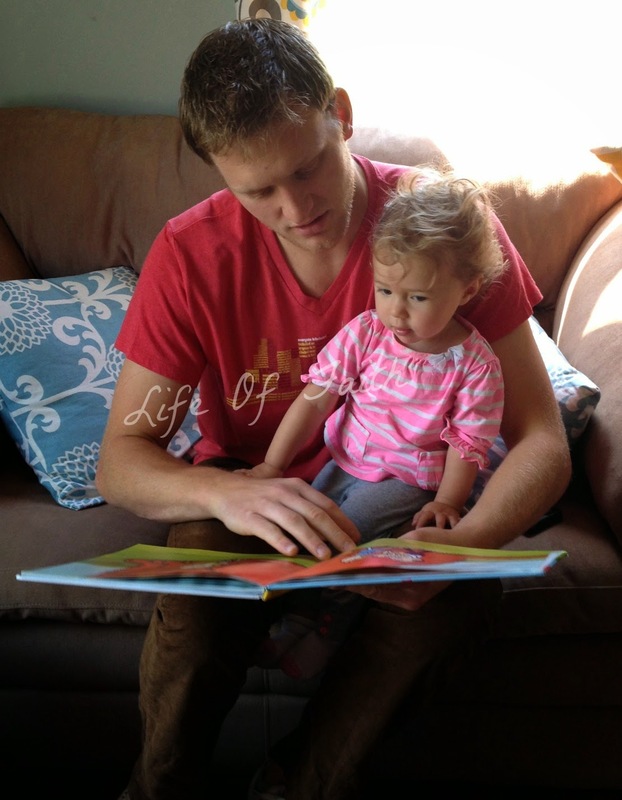 You also warmed up to Jake after a couple of days, and you let him read you your favorite book, Clifford! 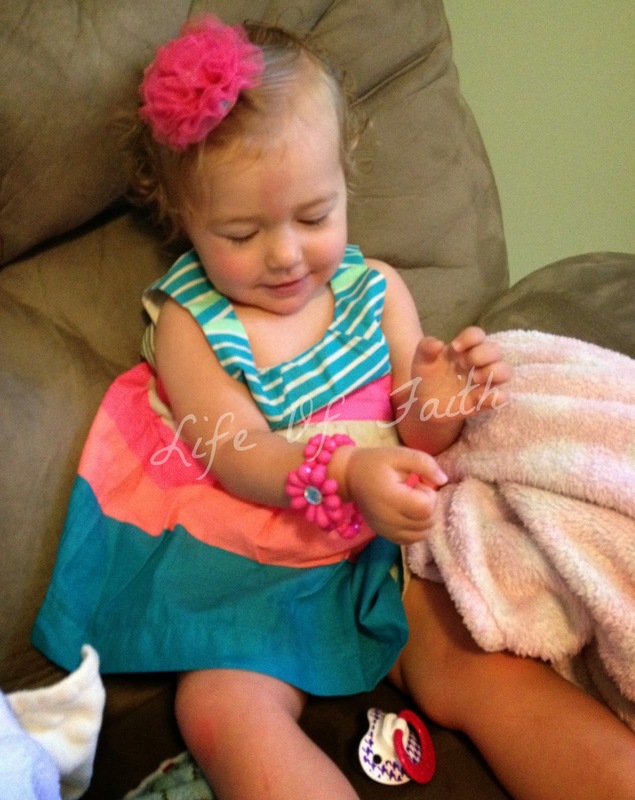 For Easter, mom and dad bought you your first bracelet to go with your Easter dress. We put it on you after you woke up from your nap and you thought it was the coolest thing ever! 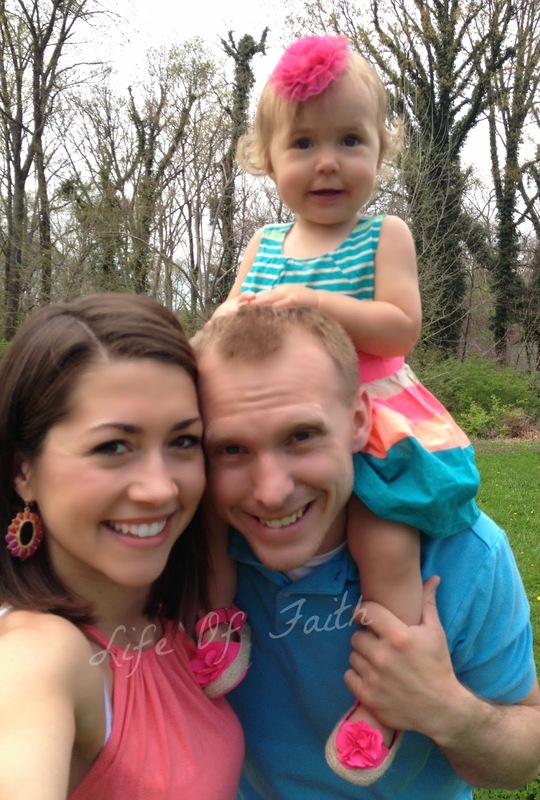 Here's a few of our Easter photos! Watching you grow and learn makes me so happy. As your personality continues to develop and you gain independence, we are praying for wisdom as to how to best guide you and teach you things like obedience, patience, self-control, and kindness. 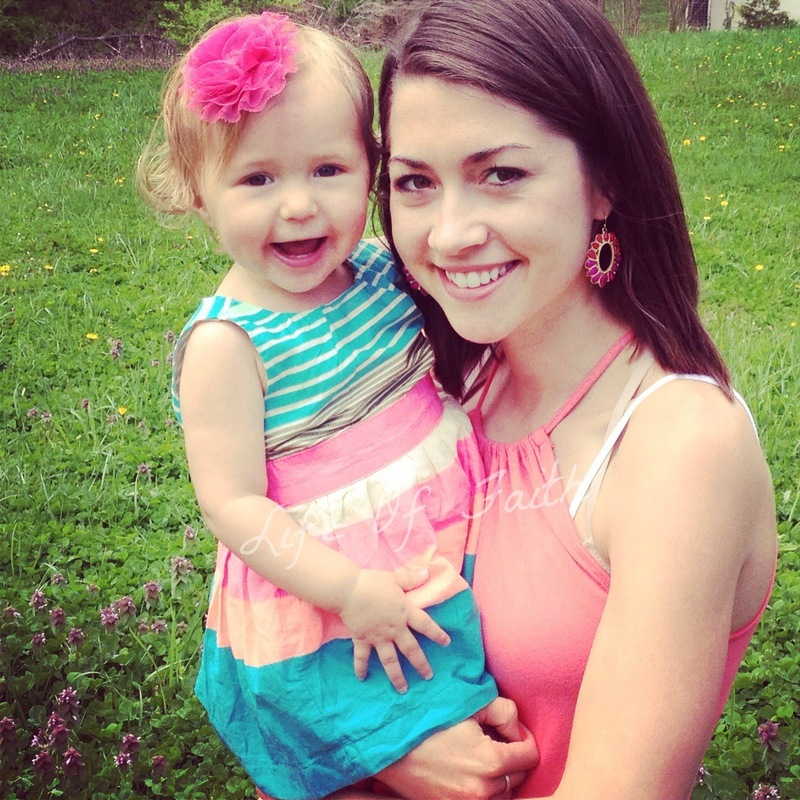 You are the sweetest little girl I know, and still love to give hugs, kisses and snuggles to your mama and dad. I know you won't always be that way so I cherish each one. I thank God for every day that I get to spend with you, even the tough ones! They weren't kidding when they said "the days are long but the years are short". I can't believe you are almost a year and a half already! I'm glad you enjoy spending time with me whether we're running errands, doing housework, or playing at the park. You are my favorite little helper! I love you so much! Awww :) she's such a cutie! Loved the family photos! Thanks Chrissy! She is getting too big! What a cutie she is! My little one is 16 months old as well. I think she and your little one would have a ball together :) I'm finding little girls are so much fun. Although I wonder if I'll be saying the same thing in about 15 years haha! Thanks Leilani! I bet they would :) Yes, I get stressed just thinking about the teenage years. I'm hoping that if I do things right now, it will pay off then. Maybe? lol! We will just have to stick together! gorgeous photos!!! 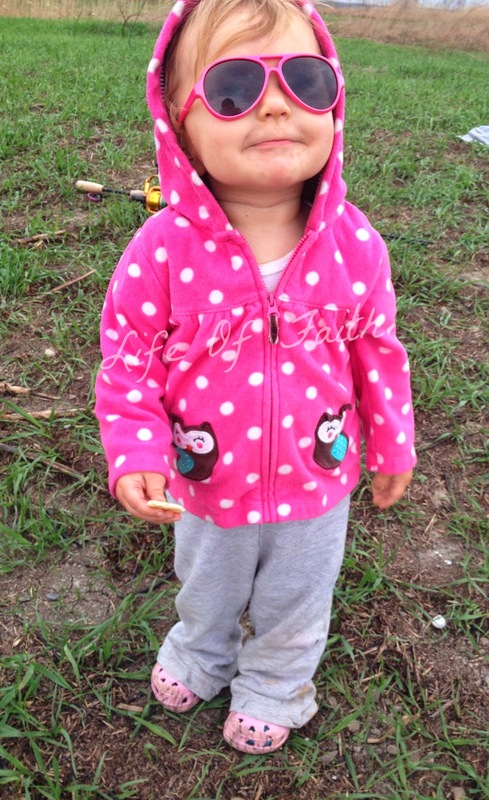 So cute that she loves fishing with Daddy, my hubby is already counting down the days until that happens. 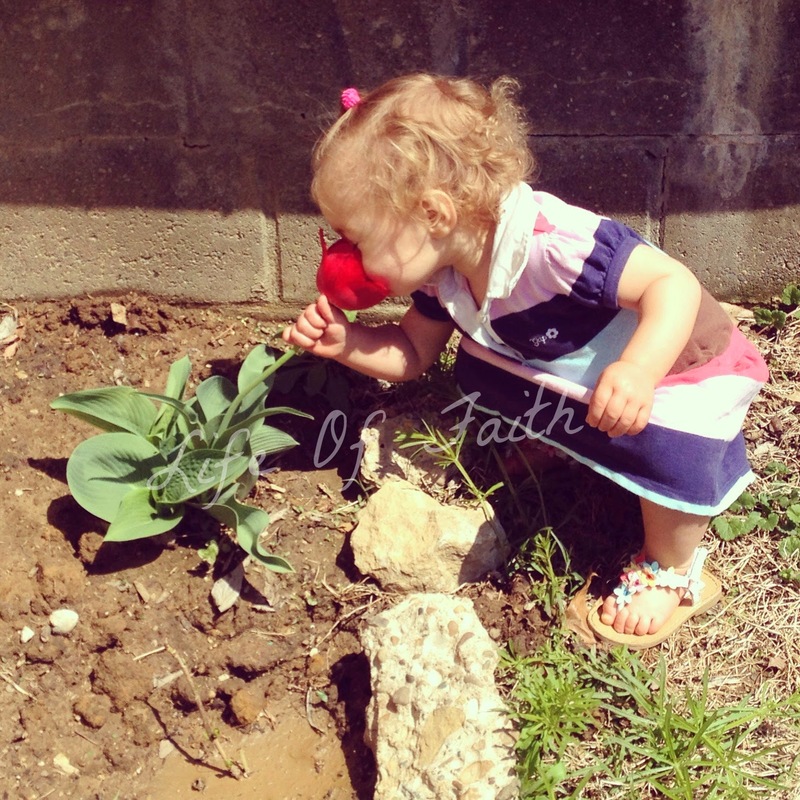 Love the picture of her putting the flower basically up her nose! haha, guess it smelled good?! Adorable!!! 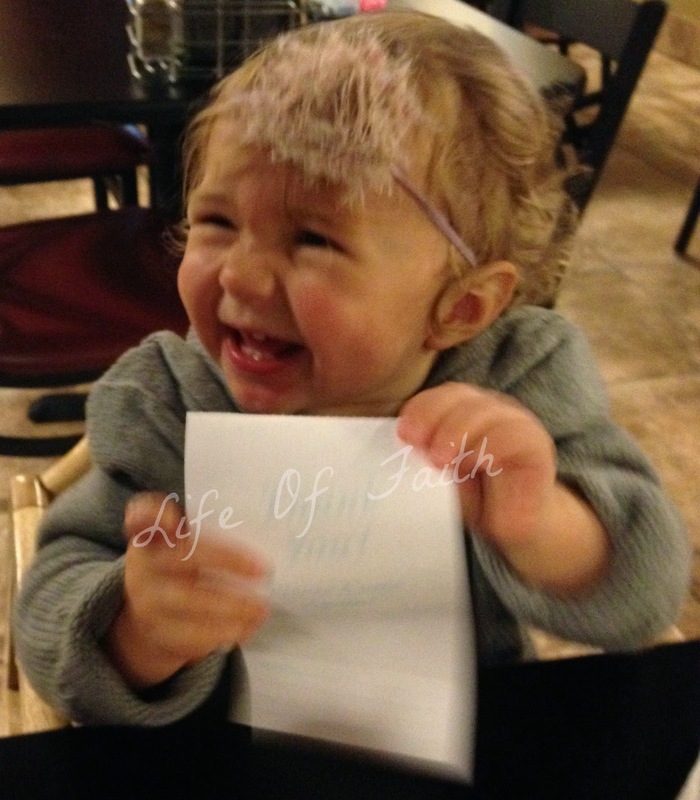 I love getting to read your updates & picture catch ups on your little one. She is just too adorable. 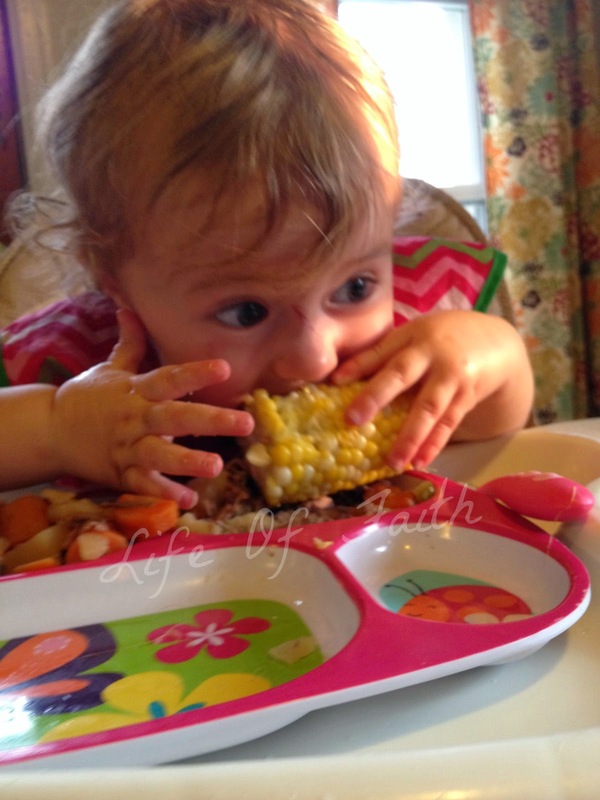 All your pictures are great but I think my favorite in this post is the one with the corn cob & crazy eyes, too cute! She does seem to be a lover of the outdoors & I bet daddy is super happy he has himself a fishing buddy so early on in his precious little daddy's girl! Cant't wait to read your next update! 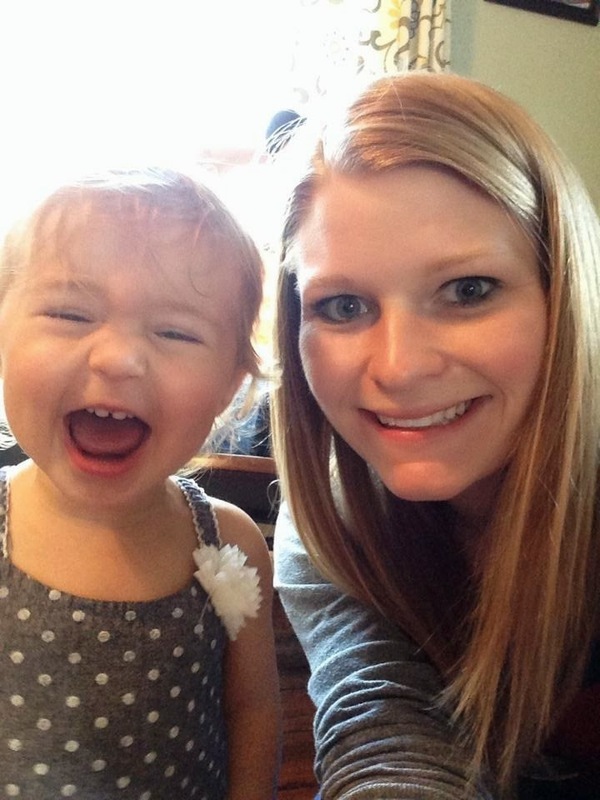 Thank you for your blog, my daughter is the same age! It is so amazing to watch them grow every day, but also definitely challenges our patience! Great work capturing some amazing memories, I will continue to follow you. 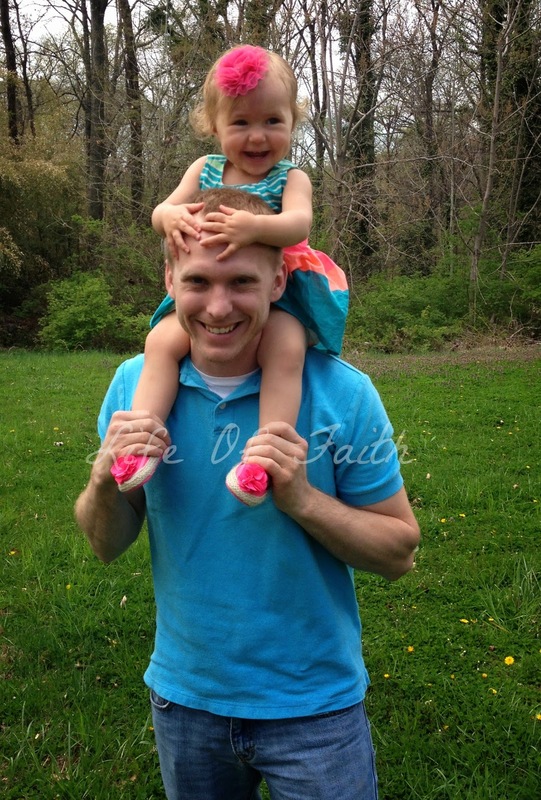 Your daughter is adorable!